Choosing the Right Type of Surface for Furnishings. Akin to the old “paper or plastic” question, furniture providers typically offer wood, veneer or laminate surfaces for case (non-seating) furniture. Choosing the right surface type for the finished piece can make a meaningful difference in the life span and beauty of the product. VENEER is a process which takes incredibly thin layers of wood and permanently bonds the layers to a solid or composite core. The advantage to veneer is a consistent, uniform appearance of graining and real wood character with less expense than some species of solid wood. The disadvantage to veneer can be adhesive failure that may eventually cause the veneer to separate from its core. Also, the wood core may expand and contract differently than the solid core further complicating adhesive issues although modern veneers seldom experience these types of issues. advances in the technology used to adhere and seal laminate surfaces. UV processes have most recently been used in laminate finishing to create a highly durable surface that can be almost indistinguishable from real wood. Laminate is often the best choice for heavy use environments. 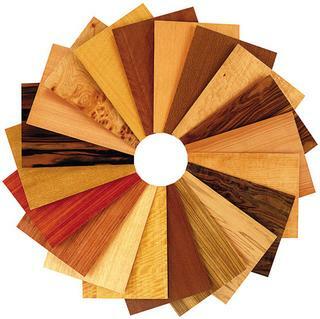 SOLID WOOD is, as the name implies, a wood surface without veneer or laminate. While solid wood offers an aesthetic that allows the natural beauty of the wood to shine through, “solid wood” is in fact a process which permanently bonds planks of wood together to create sheets of wood for furniture building. This process allows for the natural expanding and contrasting of wood without cracking or ruining. Wood surfaces can be finished with paint, lacquer, catalyzed lacquer, varnish or catalyzed varnish. Solid wood surfaces can suffer dings and scratches but on the up side can be refinished or painted over time to create new-looking surfaces. Catalyzed finishing processes add extra durability and longevity to the finish. Choosing the right surface for your furnishing purchase depends on the type of use expected. Always consult your salesperson or design expert for the right advice for your needs. Don’t forget that quality construction is always the right choice. Don’t be fooled by low-cost construction that will fail regardless of the surface type.